Labor Day weekend is the unofficial end of summer at the lake. For the second straight year it was a long adult weekend with the JPs and VLs. They left the kids at home and joined us on Thursday night. We had an absolutely gorgeous weekend to spend together enjoying lots of sun and fun together. Mornings were quiet and lazy. Everyone generally took their time getting up, having the first cup or two of coffee/tea, and easing into the day. Eventually the six of us ended up chatting around the table over a bite of breakfast. Time typically flew and it was suddenly mid-day. Friday we took the JPs’ boat to the Red Head and spent the afternoon in the pool there. Lake traffic gets pretty hairy on holiday weekends and makes for unpleasant boat rides. We chose to make the long jaunt to the Red Head on Friday figuring it would be a little less crowded, and we were correct. On Saturday morning Shay and the ladies coerced the men to join them on the dock for yoga. Shay did a great job leading us rookies. I will say that doing yoga for the first time on a floating dock made balance even more of a challenge. Despite the occasional attack of horse flies, we managed to make it through. I think more yoga may be in the future for Wendy and me. That afternoon we took the much shorter boat ride to our other favorite hang out on the lake, Bear Bottom. We didn’t arrive quite as early as we’d hoped, but were still able to get prime seating at the swim-up bar. We enjoyed a couple of hours of fun and conversation before heading back. We took the boat back to Bear Bottom that evening for their fireworks. Sunday was a lazy day on the dock. I enjoyed scoring the Cubs game on the deck (despite their loss) while everyone else hung out on the chill raft. I eventually joined them. JP’s sister and family swung by on their boat and hung out in the water with us for a while. Each evening together was spent enjoying a meal along with good conversation and Wendy’s cheesecake. There was also reading, playing cards, and watching DVDs. On Monday morning we headed to Chances R for breakfast together before the crew packed up and headed home mid-day. Wendy and I are working remotely this week and welcome some more friends tomorrow. Storm clouds gathered. Rain poured. Sirens blared. But we survived the tempest! It’s well established that summer at the lake starts on Memorial Day weekend and ends with Labor Day weekend. We typically try to start summer early each year because May often provides the weather for it and it’s nice to get in some time at the lake before the summer crowds arrive. It just wasn’t in the cards this year. The spring has been cool and wet, and Wendy and I have been busy at home with landscaping and work among other things. Cubs on the radio. Moscow Mule. Good book. Hello, Summer! So, we were really looking forward to getting the summer kicked off on Memorial Day weekend. We headed down Thursday evening to get the Playhouse opened up. The VLs joined us on Friday. We enjoyed afternoons at Captain Ron’s beach and on the dock, boat rides, and of course there was lots of good food, drink, and conversation. We did have some rain, and even a tornado siren or two, but that just afforded the opportunity for reading, eating, drinking, and chatting indoors. The VL boys, meanwhile, enjoyed the addition of the PS3 in the lower level. The VLs headed home on Memorial Day. 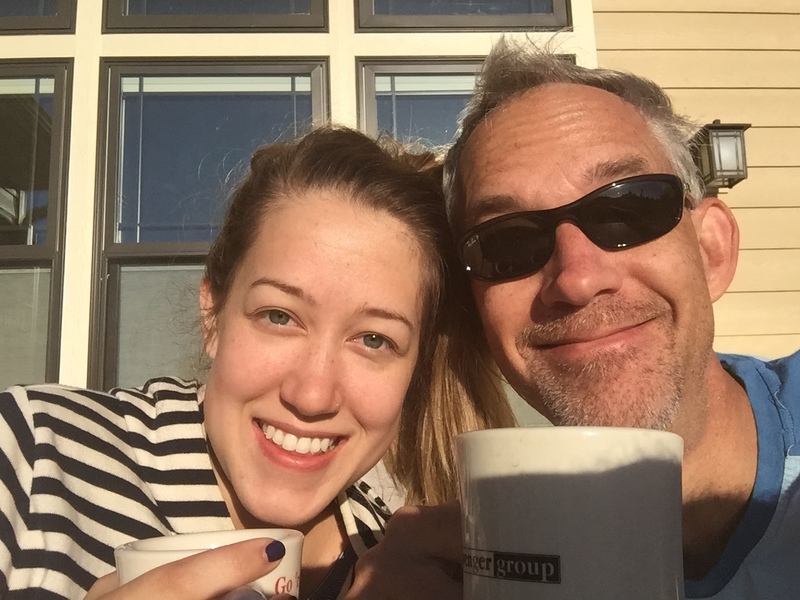 Wendy and I stayed for the week and worked remotely. We did, however, afford the opportunity to spend an afternoon at Bear Bottom and enjoy some French Open tennis while hanging out at BWW’s in Osage. My folks arrived on Saturday afternoon with our niece Emma. We hung out on the dock and went to Captain Ron’s for pizza. Rain washed out our plans for an evening boat ride so we watched a movie. Wendy and I packed up and headed home this morning, leaving the folks and Emma at the lake for the week. It was a nice kick-off to summer. Here’s to a great season of making good memories with family and friends! Summer 2016 wound down with a beautiful 12 days at the lake with family and friends. A full autumn schedule has begun. Here’s the latest…. The Shootout included an “air show” which we watched from our dock. Wendy and I spent relatively little time at the lake this summer in comparison to previous years. We were, therefore, ready for some sun and fun in August. We headed to the lake on August 25th. That weekend was the annual Lake of the Ozarks Shootout, an annual speedboat race that is centered out Captain Ron’s, the resort in our cove. The timed runs take place on the main channel outside our cove. It’s a big deal at the lake and makes for a crazy weekend with a lot of activity around our place. Wendy and I usually avoid that particular weekend, but we’d planned all summer to try to get Madison there around that time. As things turned out, we weren’t sure Maddy Kate was actually going to make it. She had a few issues with her car at the last-minute. She ended up driving but splitting up the trip, stopping in Nashville to stay with a Pella native who was happy to help her out. Madison arrived on Monday. The weather that week was a little rainy, but we still found time to get out on the boat, go out to eat, and enjoyed some family movie time in the evenings. With school back in session the lake is very quiet, which affords us the opportunity to spend more time on the water. Our little 18′ runabout, Apollonia, doesn’t do well when things are choppy on the lake, but it was quiet enough that we were able to take Madison to Ha Ha Tonka State Park by water. Wendy hiked with us to the natural spring there, but opted to stay with the boat while Madison and I hike up to the top of the ridge to visit the ruins of Ha Ha Tonka Castle. It was a gorgeous day, and on the return trip we stopped at The Nautifish for an afternoon cocktail from Buff, our favorite bartender at the lake. It was so fun to spend four days with Madison. She’s doing well with her budding career at new community in South Carolina. We’re proud of her adventurous and independent spirit. On Thursday night we all went to Captain Ron’s for dinner and she took off for home early on Friday morning. A few hours later, on Friday afternoon, our friends the JPs and the VLs arrived for Labor Day weekend. Both families had been there earlier in the summer, but this was a weekend for the adults. The JPs brought their boat and we enjoyed a weekend full of the nicest weather Wendy and I experienced at the lake all summer, beginning with a late evening cruise on Friday evening after dinner. On Saturday we took the boat all the way to Shady/Lazy Gators which was a long (over an hour) ride in very choppy water created by heavy lake traffic. Wendy and rode in the front on the way there which was a bit like riding a mechanical bull that occasionally sprays you with water. We had lunch and hung out at the pool for a while before heading back. We made a brief stop at the Red Head before determining it was too busy, and then proceeded back to the Playhouse. The JPs have a water mat that we threw out off the dock and enjoyed floating and enjoying each other’s company. We grilled out and had an amazing steak dinner that night. On Sunday we went back to the Red Head by boat, but made it there early enough to beat the crowd. We enjoyed hanging out in the pool, having lunch right there in the water. Sun, fun and conversation before heading back to the Playhouse for more fun and frolicking off the dock. We returned to find a number of large yachts tied together at the back of the cove, with everyone floating off the back enjoying the sun and water. We enjoyed a meal of appetizers and wine and settled in to watch Hail, Caesar! (though not everyone stayed awake). On Monday morning we went to Chances R for a local greasy spoon breakfast before packing up and heading back to Iowa. Wendy and I started rehearsals for The Christmas Post immediately upon our return and I had to make a business trip to MN/WI. I also had my first meeting back at the helm of Union Street Players. Enjoyed Face Time chats with Taylor while she was in Scotland. Taylor received a “Spirit of Fringe” award from her section. She also enjoyed her flat mate Aiden who brought lots of color and laughter to her experience! Taylor finished up her time in Scotland working at the Edinburgh Fringe Festival. She had a ball and I so loved seeing the joy on her face in all of the Snapchat, Facebook and texted photos. Unfortunately, Wendy and I didn’t get to actually see Taylor before we headed out to Kauai on vacation. But, more about that later. Wendy and I have spent less time at the lake this summer than ever since buying my folks’ place back in 2008. There are a number of reasons for the reduction in lake-time including our increased involvement in Tulip Time, our trip to Scotland to see Taylor, Taylor’s move back home, a new house that still requires a number of projects to get settled and finished, my parents transitioning into a retirement community, three weddings in August, and Suzanna’s final summer home and launch to college. As summer wanes, we figured we’d better get in some time down south before it’s too late. We headed to Missouri on Tuesday, Sep 1st. Wendy and I worked from the lake and did some much needed cleaning up before our friends Matthew and Sarah joined us for Labor Day weekend. Matthew and Sarah were celebrating their three week anniversary (one of the weddings in August) and since they didn’t take a honeymoon after the ceremony this provided them with a much needed getaway for the two of them. As soon as Matthew and Sarah arrived we jumped in the boat and headed to Bear Bottom for an afternoon of sun and fun in the pool. It was a gorgeous weekend and Saturday was also spent in the sun, this time off the dock. We had a fabulous grilled steak dinner on Saturday evening followed by watching the movie A Little Chaos (highly recommend). Sunday morning was spent in some amazing conversation before our friends headed home. The lake gets so amazingly quiet after Labor Day when all the summer revelers have left for the season and only the residents are left. We enjoyed breakfast at local greasy spoon, Chances R, on Tuesday morning. On Wednesday morning we took a nice cruise on the lake (we were the only boat out there) before grabbing pizza at Captain Ron’s for lunch and heading home where we found new sidewalks out front of Vander Well Manor thanks to G&B Concrete. We got settled back in at home, and Wednesday evening was spent doing handyman duty as we had a couple of nightstands and a desk for Wendy’s office for which there was “some assembly required.” The nightstands were a cinch, but the term “some assembly required” was a bit of an understatement for Wendy’s desk which game in about a half-million pieces. Got ‘er done, however. Suzanna came home from college for the first time on Friday. It was great to see her. She’s enjoying her freshman year at Hawkeye CC while living on the UNI campus. One of her friends from USP had a birthday party on Friday night and Suzanna came home to surprise her. Wendy and I enjoyed a date night at Kaldera with our friends Dan and Anna on Friday. As always, good food, good friends, and good conversation were a winning combination. We were among the first to arrive and the last to leave our favorite Pella eatery. Taylor has been house-sitting again this weekend but came home for our routine family breakfast on Saturday morning. Wendy wasn’t up yet so Taylor and I sat out on the patio in the gorgeous early fall sunshine for coffee and conversation. So excited that Taylor has an interview for a job on Wednesday. More on that at a later date. The one last major project at VW Manor is our lawn. We missed the window for planting grass in the spring. The result has been a muddy, weed infested, wasteland of a yard which I’ve told people was landscaped by the four horsemen of the apocalypse. 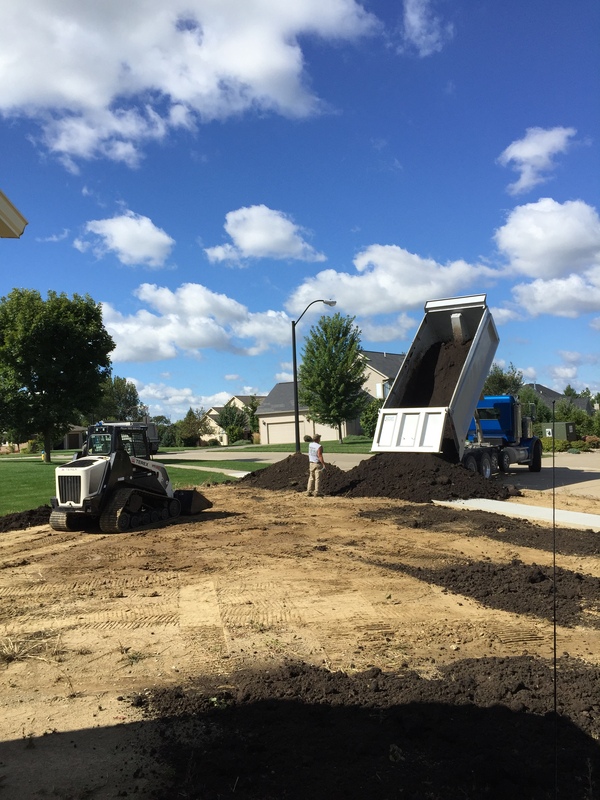 We’re finally getting that remedied and on Saturday morning Hackert’s had the black dirt delivered and grading began for what will eventually be an actual yard. Seeding should take place early next week. Saturday morning was clean-up day as Wendy and I prepared to host the VLs and JPs for an Iowa-Iowa State football extravaganza with dinner following. The crew arrived around game time and we set up in the V-Dub Pub downstairs. Wendy and I, Cyclone fans, were outnumbered by black and gold but it was a good natured crowd 😉 At least it was a good tight ball game which kept everyone interested until the final couple of minutes when the Hawkeyes took the lead and the Cyclones imploded. Ahhhh, as a long-time Cubs fan I’m reminded that there’s always next year. We ordered take out from George’s for dinner and enjoyed ourselves late into the evening. Speaking of the Chicago Cubs, Wendy and are still excited about baseball in mid-September for the first time in years as our beloved boys of summer make a run towards the post season. Go Cubs, go! Driving Tom & Wendy’s boat! Hazy days didn’t dull the fun. A pair o’ pirates fer sure, matey! Hanging out at Captain Ron’s. Camille enjoying a morning cruise. Fun in the bow of the boat! Driving Tom & Wendy’s boat. Waiting for the food. Searching for things to do. Playing on the beach at Captain Ron’s. Walking back from the beach. Waiting for the food. Finding things to do. A little beach time at Captain Ron’s. Dinner at Larry’s on the Lake. A bit chilly, but fun just the same. It didn’t rain ALL the time! Fun weekend with the VLs! Wastin’ away again in Margaritaville. When it rains there’s always movies! Star Wars was a big hit. The VLs hangin’ with the Captain. Memorial Day Weekend is the traditional start of summer at the lake. The Pella VLs joined us for a weekend that, unfortunately, was cooler and rainier that we had wished, but it didn’t dull the fun. There was fishing: a few small ones caught, a big one got away [sorry Chad], and Aaron dropped his pole in the lake (thanks to Dad for fishing it out of the bottom of the lake on Sunday morning). There were movies: Star Wars was a big hit with the kids (of all ages) this year. There was also reading, frisbee golf, boat rides, Captain Ron’s beach, and plenty of food and laughter. Wendy and I arrived late on Thursday afternoon and got the Playhouse ready for fun. The VLs arrived just after 9:00 p.m. and everyone hit the hay fairly early. On Friday we headed to the beach at Captain Ron’s in the afternoon. It wasn’t exactly sunny, but the rain held off and the kids enjoyed the sand and water. In the evening we had a lovely dinner with salmon on the grill and, after the kidlets went to bed, the adults enjoyed conversation on the deck. Saturday started out pretty rainy, but by the afternoon there was a break and we headed to Larry’s for dinner. We’d never been there, so it was fun to try. Food was great and we all enjoyed the boat ride there and back. Sunday we headed back to Captain Ron’s in the afternoon and enjoyed grilling out burgers and brats in the evening. The VLs headed into Osage for some frozen custard while Tom and Wendy held down the fort. Monday morning was the requisite donut run to Sunrise Donuts. Afterwards, Tom and Chad took the kids for a long boat ride. Then, it was time to pack up for home. It goes so fast, but the memories last a lifetime!